It's a treatise on marriage, or relationships, as our heroine analyzes what it was that brought her and her husband together ... and if that is enough to endure. my source: saw on daughter Anne's Goodreads list and heard about on NPR; please come borrow my hard cover copy! Having to wait for a copy of a new release to come available from the library hurts my hot-off-the-presses intentions... wish I had remembered to snag yours! 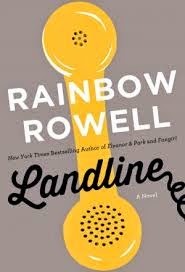 Heard this one reviewed on NPR and added it to my list right away, but the delay meant I did get to a couple of other older Rainbow Rowell books in the meantime, and I learned I like her a lot! Attachments was fun.